Black women’s lives matter. Our lives matter, even when the violent crimes committed against us go unpunished. Violence against Black women is not new. Our plight is discussed in some circles, but often ignored in many others. This leaves women feeling unprotected and vulnerable. The #BlackLivesMatter campaign was started by queer Black women. Yet Black men are given credit for organizing protests, and are seen by media as the default spokespersons of the movement. Again, Black women’s contributions to ending violence against us is too easily brushed off by media and uncaring Black men. Many Black men will not advocate for the rights of Black women. And they especially will not denounce violence imposed on us from other men. So, we have to do it ourselves. Knowing this is what prompted the #SayHerName movement of national protests last week, which brought attention to the murders of Black girls and women who have been murdered by police. We say their names because they must be remembered. We say their names to remind ourselves that violence can affect all of us. The word “powerful” has been used to describe the sight of bare-chested sisters with fists pumped high, lining the streets of San Francisco’s Financial District during last week’s #SayHerName protests. Members of the BlackOUT! Collective were representing in all shapes, sizes, and hues of unapologetic Black beauty. This diverse collage of Black women—trans, cis, queer, and straight—stood together in solidarity. Whether you connect with the BlackOUT!’s chosen form of activism or not, it matters that our stories were heard. It matters that these Black women named and honored the Black girls and women—including our trans sisters—who have been snatched away and silenced. We must not forget them. The efforts of the BlackOUT! Collective reminds us not only of the dangerous effects of police brutality, but of the fact that our justice system as a whole is steeped in white supremacy. It was never designed to serve Black women, our families, or our best interests. While Black women and our allies protested last week, former Baltimore Raven Ray Rice received nothing more than a slap on the wrist for last year’s domestic violence dispute, in which he was caught on camera punching his then-fiancée Janay Rice and knocking her unconscious in an Atlantic City casino elevator. Due to his successful completion of a court-mandated intervention program, and payment of a $125 fine, Rice is a free man. Because the system doesn’t value Black women. The timing of these two events—the #SayHerName protests and news that the charges against Rice had been dismissed—resonated with me. The ruling dismisses the violence Janay Rice suffered at the hands of her husband. The punch from the former NFL running back was hard enough to knock her out and then Rice can be seen on casino cameras, dragging a still unconscious Janay from the elevator. The incident was as disturbing as the sight of Janay, standing by her man in court. The news of Ray Rice’s charges being dropped further proves that violence against women shows up as policy in courtrooms and institutions, where laws on the books leave children motherless, and families and communities to mourn loved ones. 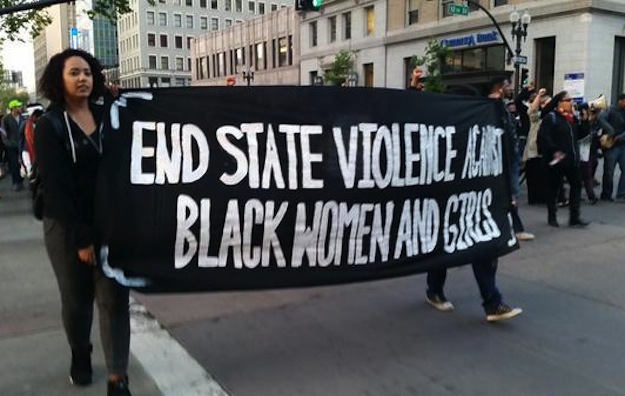 State violence against Black women makes us vulnerable on many levels. It uses the legal system to undermine our well-being, and thus we struggle to have our basic human rights acknowledged. Even when we’re not killed by police or our partners, the justice system is working against us—as it did in the case of Marissa Alexander. No woman should be in prison, away from her children, for protecting herself from her abuser. In all of these instances, the message to us is clear: We. Don't. Matter. Not you, not me, not our dreams, not our children. They remind us that we will not be protected. Sure enough, comments posted across social media demonized Black women for standing up and challenging the violence that threatens us daily. The intent of the haters was to bring shame to Black women for forcing people to acknowledge the violence against us that they have ignored for too long. Instead of being offered support, we are told we talk too much, or that we don’t support our brothers. We do support them. We love our sons, husbands, and dads. We show up for them, even when they don’t show up for us. And now it is time for us to show up for ourselves. Our survival as Black women and girls, and the survival of our families and communities, is dependent on on us speaking out and demanding change. Our stories matter. Hashtags like #SayHerName, #BlackOUT, #BlackWomensLivesMatter are necessary. We can no longer be silent; the cost is too high. C. Imani Williams is a freelance writer and human justice activist. She holds an MFA in Creative Non-Fiction writing from Antioch University, Los Angeles, and a Masters in Guidance and Counseling from Eastern Michigan University. Her work has been published in Between the Lines, Tucson Weekly, The Michigan Citizen, Harlem Times, and with various popular culture, health, news blogs and magazines.